SmartWater is an international crime fighting and crime prevention company with an established track record for detecting and deterring criminal activity. They have created a wide range of crime reduction programmes that use their cutting edge forensic coding technology to reduce crimes such as burglary, robbery, vandalism, trespass and metal theft, achieving major and proven success. SmartWater was the first forensic coding manufacturer to achieve a Grade A External classification as part of a Publicly Available Specification published by the British Standards Institution (PAS 820:2012). This means their products have been independently tested to last the equivalent of 5 years in external weather conditions. Remember this price is not a annual subscription but a single payment of £25.00. ® SmartWater, the SmartWater yellow, atom logo and THIEVES BEWARE® are trademarks of SmartWater Limited. SmartWater is a proprietary forensic asset marking System and Strategy protected by worldwide trademarks and patents. These allow special items…..Mowers etc. to be kept safely in an alarmed shed or cupboard. If tampered with the “movement sensor” will activate. 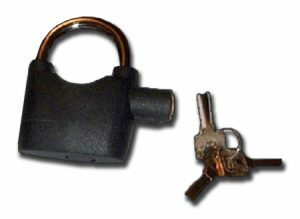 The Padlock Alarm can be used, if required, without the alarm being set. Battery operated.